Today Robot Wars returned for its third rebooted series and it was a mixed bag overall. While all of the robots feel far better quality than previously the arena is in its worst state yet. Let’s talk about more dramatic changes first though and that’s the change to the structure of the bouts themselves and finally they’ve realised that the Round Robin system of fights, that meant those who faced a strong opponent earlier had a massive disadvantage, has been done away with entirely and the heat robot count from 8 to 6. Instead a system similar to the old Wars has been instituted of two initial 3v3s, followed by the 4 runners up fighting in two 1v1s for a final pair of semi final places (where the two initial winners already have a slot in either semi) that are also 1v1, then the two semi winners face off in the final while the two losers have a third place runoff. 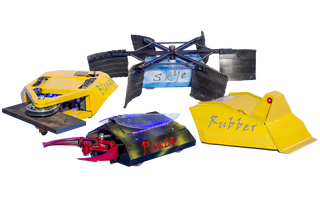 This is all part of the new series wide system where the final episode has the 5 winners while the sixth place goes to the winner of a 10 robot free for all made up of the 2nd and 3rd placed robots from the heats. This change means that each robot at most faces 4 fights as opposed to the previous 5 while the minimum number of fights goes from 1 to 2 and there’s less chances of being paired up against the same robots multiple times too. Even with this more generous system there’s always going to be those who come out as the losers of the heats and those were Donald Thump, a vertical spinner that got torn apart piece by piece, Apocalypse, an axe bot that was set alight, and the real delight that was The Swarm, a group of four mini-bots that were surprisingly effective. As hinted at the former two weren’t really up to scratch against the more professional teams on show, there weapons failing to function that well, but despite the history of minibots not doing well The Swarm really punched above its weight, managing to come fourth in a fairly menacing group. The three going through to the final episode however really dominated the show, or at least two of them did. The robot that ended up coming 3rd, Sabretooth, didn’t really live up to its performance last series, its new “improved” design fairing far worse than before with its spinner going out of commission at least once. If anything The Swarm probably deserved to go through more than Sabre did but at the end of the day it appears Sabre’s better reliability shone through. The two finalists however really did steal the show not only throughout the episode but in particular their final fight. Apollo and Behemoth both have names to live up to and their flip off was truly an amazing fight as they both attempted to sneak around each other for that one hit that would win, only for the other to recover. After a couple of close calls for each of them eventually Behemoth finally won a heat when it launched Apollo into the pit. While all of robots were great however the arena itself was not. In the previous two series panels have fallen off while the flipper has malfunctioned. This time however the flipper not only fell apart but the pit failed to stay closed, causing robots to get caught on it, before the floor spikes decided to compete with North Korea when it came to having missile capability when they decided to launch several feet into the air. It’s 3 series in now and these failures are starting to get pathetic now. But overall the first episode of the new series saw much improved structures to the competition and a better quality of robot. Let’s see if that latter point holds up next week.